Sound Walls Bound for Rockridge? They would muffle noise from Highway 24, but not everyone is thrilled by the idea. There are two areas under consideration for installing sound walls. The Caldecott Tunnel's impending fourth bore may be designed to ease congestion, but it could also add more cars to Highway 24 when it opens in late 2013. And more cars means more noise. While some Rockridge residents see this as an opportunity to finally erect sound walls along the highway through the heart of the neighborhood, others view the noise barriers with far less enthusiasm. Currently under consideration for location of the sound walls are an approximately one-mile section between Ross Street and Telegraph Avenue in the westbound direction and a 0.9-mile section between Vicente Way and Broadway in the eastbound direction. If constructed, both could impede views from the highway while reducing nearby noise levels by at least five decibels. The sound walls are merely being proposed for further study at this point, but already some residents have expressed concerns. According to Stuart Flashman, chair of the Rockridge Community Planning Council, views vary widely throughout the area. Some homeowners are opposed on aesthetic grounds alone — often vehemently. One of Flashman's neighbors doesn't want a sound wall simply because it'll block his sunsets. Meanwhile, sound-wall proponents are working to rally residents around the cause. In an effort to dispel misinformation and foster support, The Rockridge News, a publication of the planning council, has been running monthly articles on sound walls since May. July's article described the health effects of persistent freeway noise: sleep interference, learning impairment, and "a general decrease in a sense of well-being." For his part, Flashman says the noise in his backyard a block from the freeway is so loud he can hardly stand it — around 65 decibels, approximately equal to the drone of a dishwasher or electric shaver at close range. "We got a short shrift there," he said. "If this highway had been built now, there almost certainly would have been sound walls put in all along it." He's probably right. The California Environmental Quality Act didn't exist at the time the highway was built in the late 1960s, so Caltrans was under no legal obligation to build them. But the construction of the fourth bore has sparked a renewed conversation around sound walls. It all started when both the City of Oakland and the Fourth Bore Coalition — a grassroots environmental group comprising the East Bay Bicycle Coalition and neighborhood associations representing Claremont, Elmwood, Rockridge, Temescal, North Hills, and Parkwoods — sued Caltrans over environmental impacts not addressed in Caltrans' original assessment. Caltrans settled out of court, awarding $8 million to Oakland and $2.35 million to the coalition. During the settlement process, sound walls were identified among dozens of other items as priorities by the Fourth Bore Coalition, and $1.2 million was set aside for intensive studies. "From my perspective, the sound walls are one part of a very exciting package," said the Fourth Bore Coalition's Ronnie Spitzer. "Basically, it fixes what happened when they put this highway into the neighborhood." Funds from the project will be put to use throughout the Highway 24 corridor in Oakland, from sidewalks and bike lanes on Caldecott Lane and Tunnel Road to changes at the intersection of HIghway 13 and Hiller Drive. 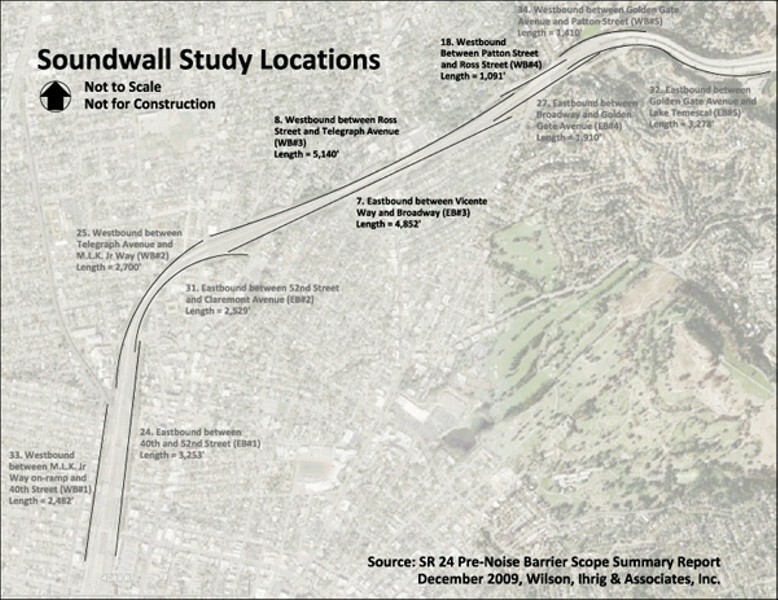 Oakland quickly commissioned a preliminary noise and feasibility study from Emeryville engineering firm Wilson, Ihrig & Associates, Inc. to identify specific sound-wall sections eligible for more detailed analysis using the Caltrans settlement funds. The study granted four sections an "A" grade for achieving thresholds related to both sound attenuation and cost per affected dwelling. Two of these sections, however, were ranked low enough on the city's 37-item wish list that further study is unlikely to be covered by the settlement funds. Rockridge resident Jon Gabel, who has examined the firm's 96-page report, argues that faulty assumptions factored into sound-level calculations that in turn justified all four walls' preliminary approval. Not only does this pave the way for costly and potentially unsightly sound walls that may not be warranted, but it also eliminates $1.2 million in funding for additional infrastructure projects such as pedestrian-scale lighting along Telegraph Avenue and on-ramp improvements at Telegraph Avenue and 56th Street. "If they're really justified by the studies, then that's one thing," Gabel said, "but I'm not sure they are." There are two problems with the report, he said. First, its "Established Worst-Hour" basis, a hybrid of measured short-term and long-term noise ratings, suggests that sound walls are in fact not needed in most of Rockridge. Second, he said, a table of computer-calculated decibel ratings at 61 North Oakland locations for the present and for the year 2030 relies on inaccurate traffic speed and volume data. This has the effect of artificially inflating sound levels beyond 65 decibels, the minimum for sound-wall eligibility employed by Alameda County (a level two decibels lower than Caltrans' standard). Gabel has posted his technical analysis of the study at RockridgeSoundwalls.org. "When you really dig into it, you find that they're obfuscating what's really going on here," Gabel said. "They're saying it's worst-case, but it's worse than worst-case." Gabel presented his critique to Steven Wolfe, president and principal consultant of the Emeryville engineering firm that conducted the study, who responded in an e-mail, "Overall I don't have problems with what you've said" — but assured him they had conformed to noise-study methodologies approved by Caltrans. Perhaps not surprisingly, Gabel is opposed to sound walls in his immediate area, even though he lives only one block from the freeway. "For me, the aesthetics outweigh the noise amelioration," he said. A small survey he completed of his neighbors revealed that about half felt the same, while half would support a sound wall. The public-process portion of sound-wall planning in Alameda County includes a more formal petition, in which 100 percent of owners of properties abutting the freeway along the designated stretch must approve the wall, as must 75 percent of those one row back. Yet even if these numbers aren't met, the city can appeal and effectively override the petition. After that comes the pair of Noise Barrier Sound Reduction Reports, estimated to cost $628,000 for the westbound section and $554,000 for the eastbound. More public meetings would follow, and inevitably more division. The process may not begin until 2012, and could last for years. If the walls are ultimately approved, they'll be eligible for up to $10 million in funding from the Alameda County Transportation Commission. As far as the design of the sound walls, that's still up in the air. They could be between seven and ten feet tall, and potentially made out of a semi-transparent material. Either way, Flashman believes it's a small price to pay for Highway 24 motorists accustomed to looking out over the leafy streets of Rockridge. "You've got to balance the benefit to some versus the damage to others," he said. "It's a 24/7 noise problem for people who live near the tunnel versus three minutes of a nice view."